When it comes to the most iconic moments in WWE history, thoughts and opinions often circle back toward WrestleMania, and rightfully so, for its scale and impact. SummerSlam, WWE's second-largest event of the year, has its fair share of famous matches and moments over the last 30 years as well. But it has also been host of some of a few of the crazier and stranger moments in WWE history. Whether it's the dog days of summer or something in the water, this time of year on the WWE calendar and everything leading up to it tends to get a little bit ... weird. It was, in fact, a challenge to narrow it down to just five crazy moments related to SummerSlam, but we think we've put together a strong selection. There was a considerable amount of hype heading into SummerSlam 2016, the second of what's now become a four-year run at Brooklyn's Barclays Center. But with the exception of a stellar John Cena-AJ Styles showdown, the show suffered letdown after letdown throughout the night. It all culminated in a pair of matches that summed up the frustration of that night perfectly. Finn Balor and Seth Rollins had their match for the first-ever Universal title torn apart by a crowd booing the design of the belt, and then Brock Lesnar and Randy Orton closed out the show with one of the most violent and confusing finishes to a major WWE match in recent history. Lesnar and Orton had been going at it for about 11 minutes when, after landing his patented F-5 finishing maneuver, an unsuccessful pinfall attempt led Lesnar to remove his elbow pads and rain blows down upon Orton's head. One particularly violent elbow opened up a massive gash over Orton's eye, and while Lesnar moved his striking to Orton's arm, the match eventually ended via an unusual referee stoppage. In the confusion, Shane McMahon came out and confronted Lesnar, and the general confusion to end the show did little to change the mood of an already conflicted audience. The fighting didn't end once Lesnar walked out from the curtain, either. Chris Jericho, who has a history of confronting larger wrestlers, walked up to Lesnar and challenged him. What happened next is still up for some debate, but it became intense enough that the story got out of the WWE bubble. "Not to get into specifics 'cause it's basically between me and Brock, but, you know, we did have a little bit of a brouhaha, shall we say," Jericho later said on the "You're Welcome! With Chael Sonnen" podcast. "I think that happens when you get guys that are in a sport such as ours -- half-entertainment, half-real, half-not -- and you know I think you get ... he had just come out of the ring, I had just come out of the ring an hour before or so, whatever, and I just thought the finish of that match was very brutal and very violent and I just didn't know if Randy was OK ... I said something and he said something, next thing you know we're nose-to-nose kind of yelling at each other ... Whatever they're doing or whatever happens, listen, man, that's the way it is. It's not my business, it's not my responsibility or my call. But, when I see a friend of mine lying in a pool of his own blood, whether it's a work or not, that's real blood, you know? That's a real concussion that he suffered." After Hulk Hogan lost the WWE world heavyweight championship to Yokozuna at King of the Ring and wrapped up what would be his last run in the WWE for almost nine years, everyone wondered who the company would get behind as its next big star. The answer to that question came less than a month later, with Lex Luger involved in one of the most bombastic displays of mid-90s patriotism that ever came to be. Luger successfully body-slammed the near-600 pound Yokozuna on the flight deck of the USS Intrepid, earning himself a world title shot at SummerSlam. 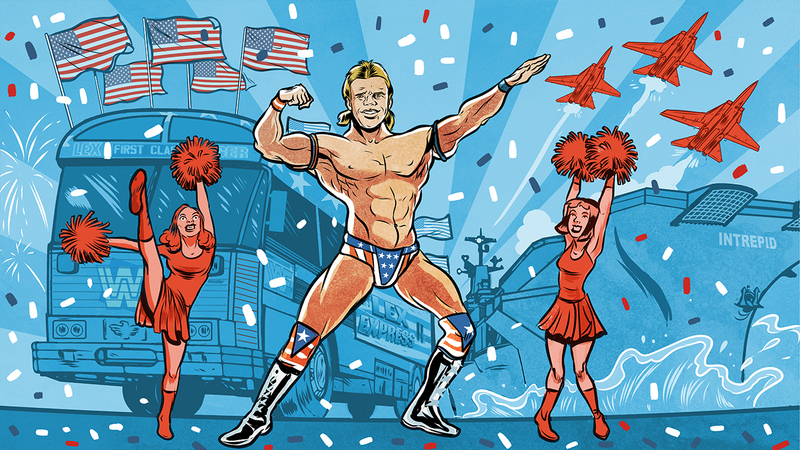 WWE then tried to capitalize on that momentum by creating the "Lex Express," a nationwide bus tour that took Luger on a simulated campaign trail to drum up enthusiasm. He visited major cities including Washington, New York City and Chicago in his luxury bus, and even threw out the first pitch at a White Sox game. Luger also visited smaller towns along the way, met fans and signed autographs, and took numerous local media opportunities to bolster his cause. It was all building up to the main event of SummerSlam 1993, with the WWE championship hanging in the balance and Luger seemingly ready to take over Hogan's mantle. The match itself was ... considerably less impressive. Luger was victorious after almost 18 agonizing minutes, but because the result came via countout, Yokozuna retained the title. Balloons and streamers fell from the rafters of The Palace of Auburn Hills as Luger celebrated his "victory," but much like the Lex Express tour, it was ultimately a big, splashy, failure. The WWE's history is filled with wrestlers whose entire character is built around a profession. There's the accountant with the initials I.R.S., Isaac Yankem, D.D.S; Jerry Lawler's personal dentist, the Repo Man, farmers like Hillbilly Jim and The Godwins and many others. There's also the Big Boss Man, a corrections officer from Cobb County, Georgia, and The Mountie, representing the Canadian Royal Mounted Police Force. 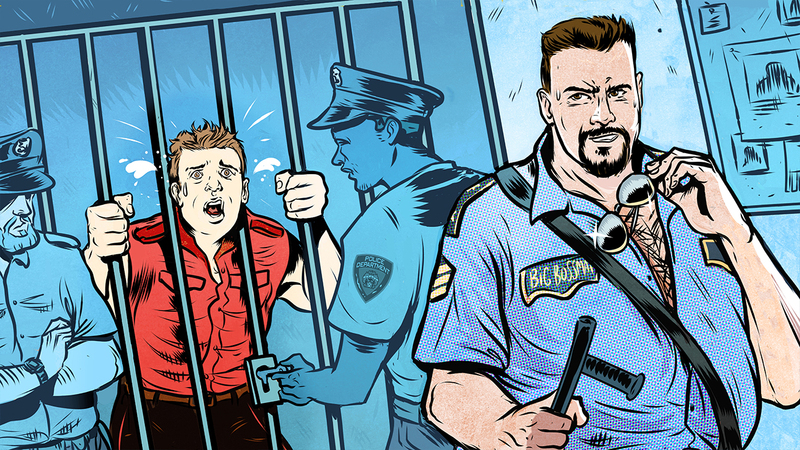 You might think two men of the law would get along with one another, but heading into SummerSlam 1991 Big Boss Man and The Mountie found themselves up against one another, and their battle of wills led them to wager a night in a New York City jail cell for the loser of their one-on-one match. The Mountie, who played up all of the negative stereotypes attached to law enforcement officers in promising to send Big Boss Man to jail, ultimately lost the match. That's when the fun really began, as The Mountie was handcuffed, thrown into the back of a paddy wagon, brought to a police station and fingerprinted before being tossed into the cell. Certain elements of the aftermath show their age, but few who've seen the clip will forget the tenor with which the phrase, "But I'm The Mountie!" was shouted throughout the night. There was a time in WWE when it seemed as though the Ultimate Warrior would be the one to succeed Hulk Hogan as the promotion's centerpiece. He was positioned as the next man up in the late '80s and early '90s, culminating in a champion-versus-champion match at WrestleMania VI in which he pinned Hogan. His colorful look and wild energy excited crowds every time he ran to the ring, but from the moment Warrior lost the WWE title to Sgt. Slaughter in 1991, the wheels started to come off in his relationship with Vince McMahon and the WWE. In the lead-up to SummerSlam 1991, Warrior and Hogan (the latter once again champion) were advertised for the main event of the show in a 2-on-3 battle against Slaughter, Col. Mustafa and General Adnan. But a month before the event, Warrior threatened to no-show unless he was paid $550,000 that he felt he was owed related to his appearance at WrestleMania VII, as well as other perks and compensation that he believed was in line with what Hogan was being paid. McMahon, having already advertised the match heavily on WWE programming leading up to the event, gave in to Warrior's demands and the show went off without a hitch. 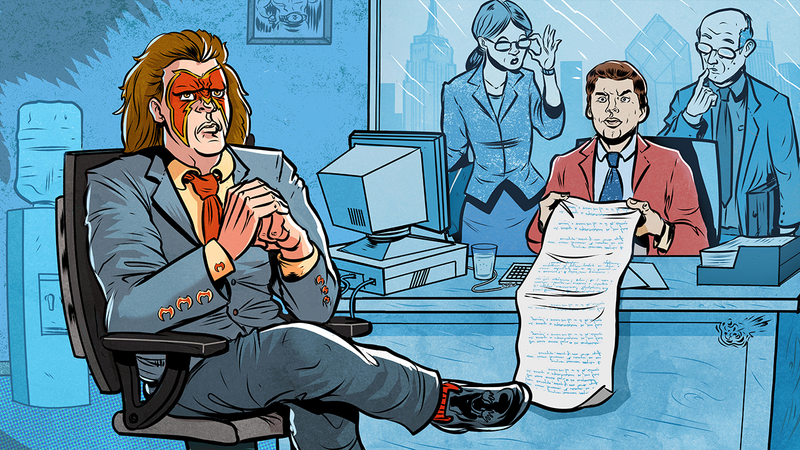 As soon as the event was over, however, McMahon struck back and handed Warrior a letter dated the same day as SummerSlam, in which he suspended the Ultimate Warrior and laid into him for forcing him into contract changes "under duress." "Your principal complaint is that you are not being compensated at the same rate as Hulk Hogan, although "Hulk" is a living legend, is still much better known to the public, has wrestled longer, is the WWF Champion, is in much greater demand for personal appearances, is a bigger star and draw at WWF events, is more dependable and is far more revered and respected by WWF fans and by the public at large," part of the letter read. "You have become a legend in your own mind; you are certainly entitled to your opinion. However, you are not entitled to vent your feelings by breaching and threatening to breach your contract." Warrior ultimately quit the company, returned for a pair of stretches from April to November 1992 and March to June 1996, but his most viable days as an in-ring WWE performer were over. It might be a little hard to believe 20 years later, but for a short stretch of time in 1998, The Oddities were one of the most positively received acts in the WWE, thanks to two major elements working in their favor. First and foremost was their entrance theme sung by the Insane Clown Posse, which had a hook and a beat that fans took to immediately. Secondly, one of the four members of the group, Golga (aka the late John Tenta) took to wearing T-shirts and carrying dolls depicting South Park's Eric Cartman at a time during which South Park was starting to catch fire. It was the late '90s and the WWE's Attitude Era ... so it didn't always make the most sense. The previously dead-in-the-water group that featured Golga, Giant Silva, Kurrgan and Luna Vachon found new life as crowd favorites, and ICP began appearing with the group and helped whip up the crowd. While the wrestling wasn't stellar by any means, the arm waving and energy during the song was undeniable. Trust me. This anomaly of a spike in popularity culminated at SummerSlam 1998, when the Insane Clown Posse sung the aptly named "Oddities" live to the crowd at Madison Square Garden to bring the group out for their match against Kai En Tai. By the start of 1999 the ride was over, and The Oddities ceased to be. 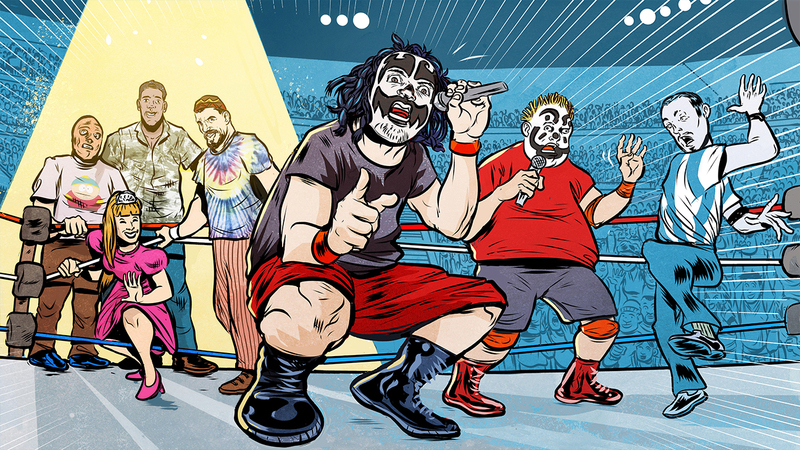 The live performance is no longer featured on the WWE Network version of the broadcast (though a full version of the performance can be found with a little bit of Googling), but for a moment in time, The Oddities and the Insane Clown Posse had their moment to shine. Editor's note: These images are a creative representation of the characters and actions described in the accompanying stories. In some cases, multiple elements of a story have been combined to create one unified image, while other illustrations feature an artistic representation of a story's central themes and aren't intended to indicate how the events in a story actually played out. Illustrations by Rafa Alvarez.